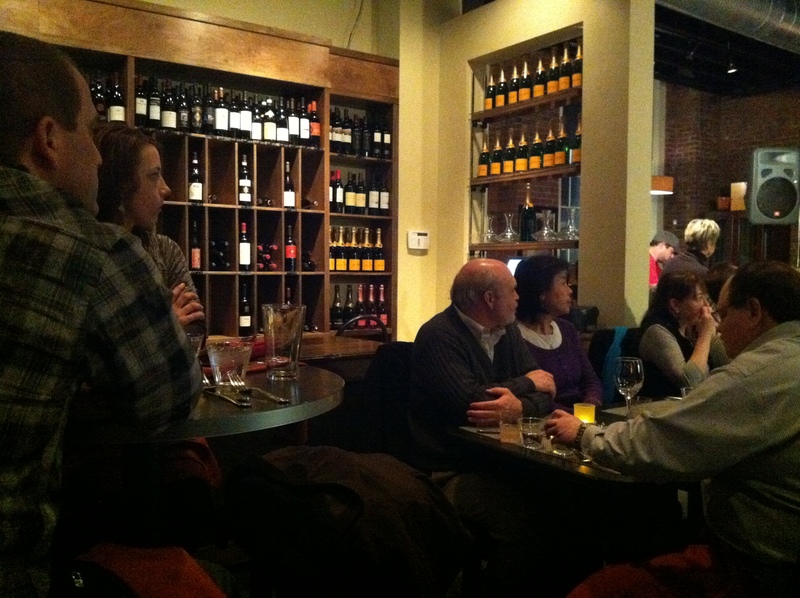 Battery Park Wine Bar | Cleveland, Ohio | dreaming of the next bite. dreaming of the next bite. Navigating the local restaurant scene, one bite at a time. the wine glass is half full. 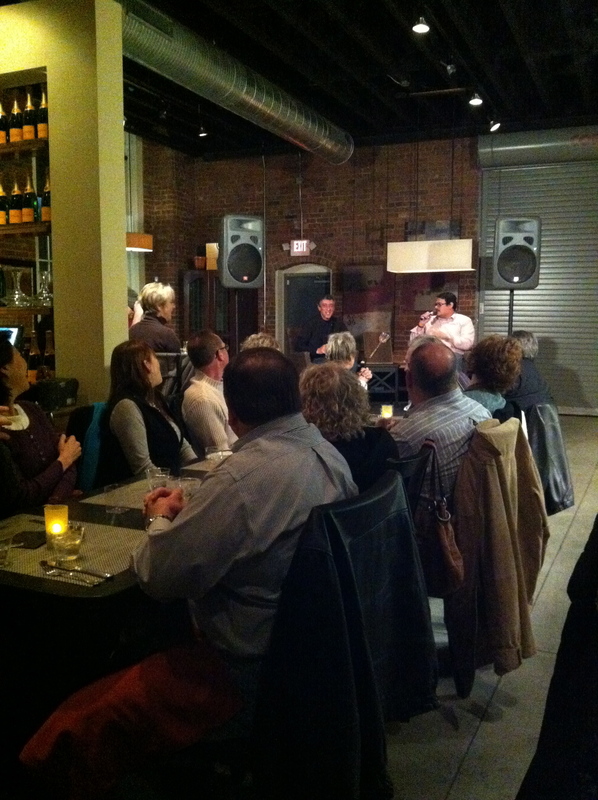 Hosted by Cleveland comedian, Ramon Rivas II of Chucklefck, and Todd Gauman, founder of NEO Food Tours, the battle began at Battery Park Wine Bar, a large industrial space near the lake, anchored by a centralized bar, with a beautiful table setting prepared for the evening’s events. The format was simple: three courses would be served at each of the competing restaurants: an appetizer course featuring scallops, the main course featuring hanger steak, and the dessert course, starring chocolate. In addition to the challenge of the two restaurants’ chefs, the event was also a competition of two comedians, so there were two simultaneous “battles” going on at once. Everyone in attendance would then vote for the winner at the close of the meal. The first surprise of the night was that each course would be paired by the chef with a cocktail, which added an interesting twist to the evening – after all, not too many Monday nights involve gourmet cuisine, comedy, and excessive amounts of alcohol consumption! 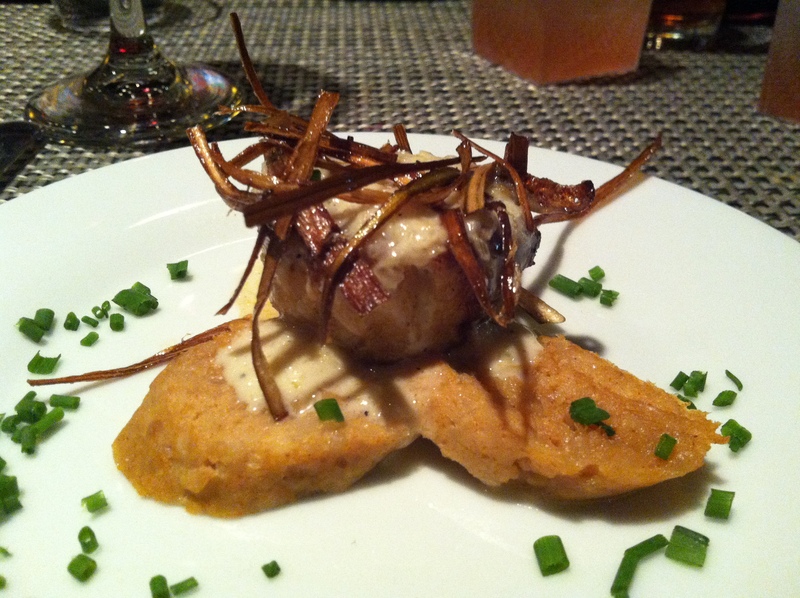 The first course at BPWB was an artfully prepared and beautifully presented scallop dish. It consisted of a grilled scallop, sitting on top of a salmon and shrimp “sausage” with a lovely lemongrass sauce and crunchy fried leeks. My scallop was delicious, as was the sauce. I will say that the texture of the seafood sausage was not a highlight for me, although it was unique. Part of the problem was definitely my issue and not a fault of the dish; the entire time I was eating it, I thought it was actually thinly sliced toast soaked in sauce. So my reaction, was what’s up with the soggy toast? – then, of course, it dawned on me this wasn’t bread at all, it was homemade seafood sausage. What a ditz. This was my date for the evening, Barbara Abbott, renowned Canton foodie and creator of Canton Food Tours, launching in May 2012. For us, the comedy aspect of the evening was secondary to the culinary experience – nothing against the comedians, but the food was obviously the reason we were here. What I really appreciated was to hear directly from the chefs, especially Chef Dimitris Ragousis; it’s not often you get to hear about the food straight from the creator! 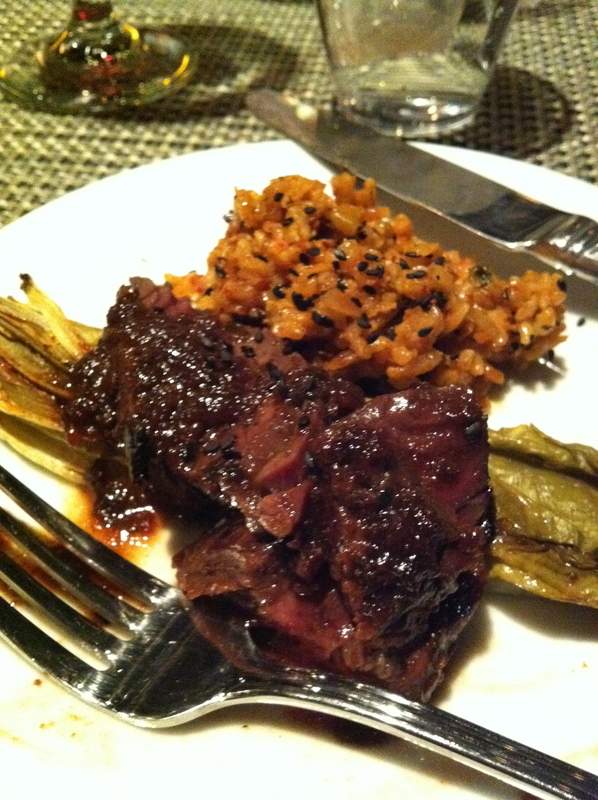 The next course was the main event, hanger steak, gorgeous on the plate and even better on the palette. It was marinated and cooked in a wonderful sauce that added rich dimension to the already tasty beef. It was placed on a bed of grilled romaine lettuce, which offered a variable texture and smokey crunch. Also on the plate was a spicy rice, which was tasty, but more of a background element so as not to detract from the fabulous hanger steak. The cocktail pairing was made with bourbon, and lots of it, but the flavors worked flawlessly with the richness of the hanger steak. In essence, it was a chocolatey rich brownie, served with some wonderful white chocolate shavings and a rich but not-too-sweet whipped cream with an almost buttercream-like consistency. (Chefs, if you’re reading this, pardon my amateur descriptions, it was so hard to retain the verbal explanations of each course, especially while keeping up with the cocktails. It would have been nice to see a printed menu, in order to really absorb (and remember) the deets of each dish!) 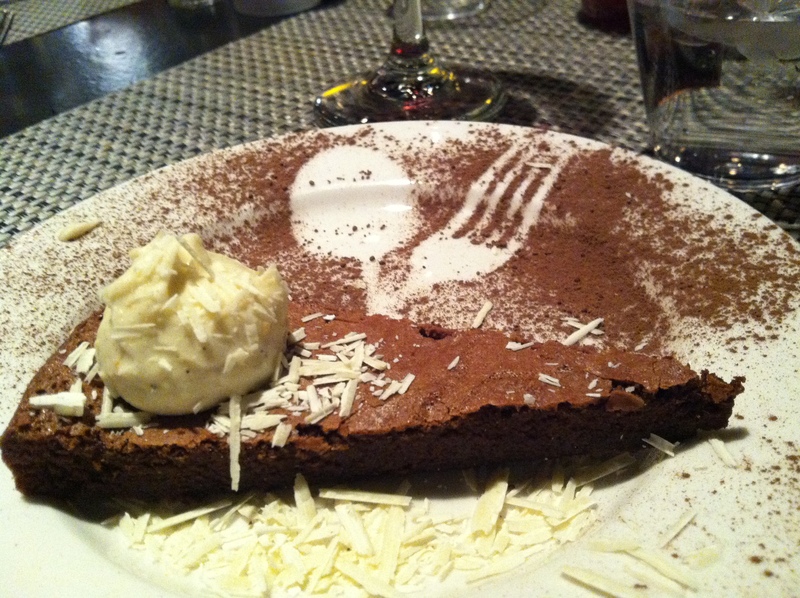 I love what the chef did with the presentation of this dessert; what a creative and artful sweet plate, with such pretty cocoa powder art, I didn’t want to mess it up. But I got over that pretty quickly. This dessert was fantastic; while I am a normal chocolate-loving female, I prefer it not be too rich, and this was a home-run in that department. With all this decadence, it seemed unfathomable that we now had to head to the next restaurant and start again. However, we were committed, and rose to the challenge. Stay tuned for my next post about our experience at Reddstone, where I’ll reveal who ultimately won this Battle for Battery Park…and offer my two cents about who actually deserved the victory. 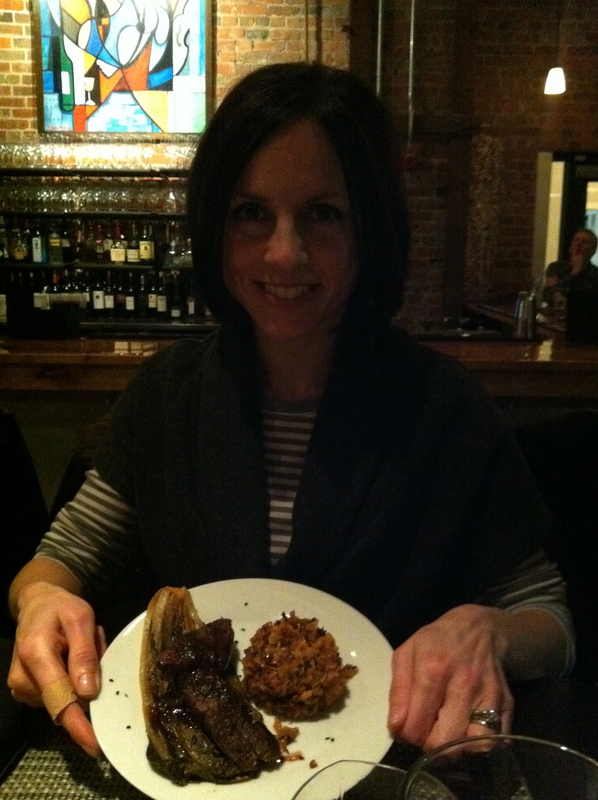 This entry was posted in Cleveland, OH and tagged dessert, scallops, steak, wine by Yvette (@foodiedreamer). Bookmark the permalink. Nice to re-live this fun evening through Yvette’s blog. It was a fun and delicious experience. I’ll hold off on sharing my favorite dishes until you find out who won! Pingback: Reddstone | Cleveland, Ohio | dreaming of the next bite.